What we have here is a scene from the forest surrounding Hackberry Hollow. 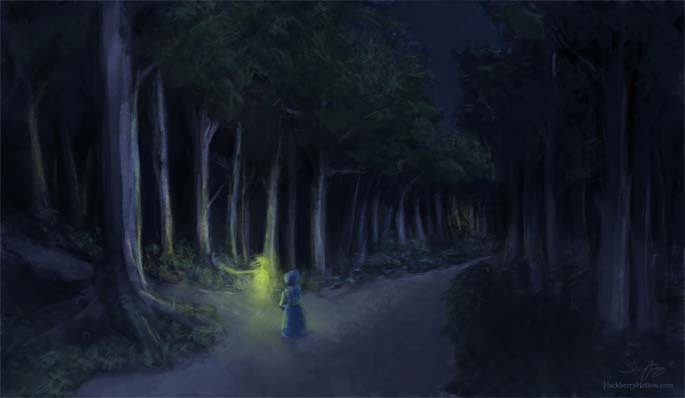 Seeing ghosts in the forest and in town was an everyday event when Hackberry Hollow was still in its prime twenty years before the story starts. It was not uncommon for one to be used as a guide directing authorized visitors to secret locations, misdirecting or attacking those who aren’t, or to fulfill any number of tasks for the necromancers that created them. Every time we create new concept art it brings us closer to the final direction that we want to go with the comic. It’s also exciting because it begins to bring our story to life as we work on it, and gives the rest of the artists and writers a clearer idea of what we’ve been talking about this whole time. The lighting in this was tricky because I have never done a moonlit scene before. Overall I’m pretty happy with the results.